something actually got finished. Well, the quilting bit got finished. I started this quilt last year but folded it and put it away when I was half-way through quilting it. I don't know why. This year I made a resolution to try put a little work in on one UFO a week. I free motion quilted a large flower in the center, then surrounded it with a meandering vine. There are leaf motifs on two of the fabrics so it ties in nicely (in my humble opinion!). You can click on the pic to make it a bit bigger if you want. In between the less exciting bits of life - the making of dinner, the folding of washing, and the doing of dishes - I'm getting organised for Quilt Symposium 2011. I was lucky enough to get all three classes I requested and am just starting to get enthusiastic! 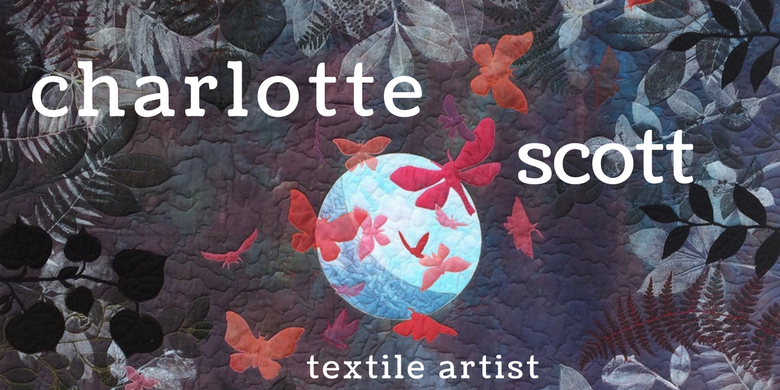 I'll be doing Celtic Cutwork with Yvonne Brown, Pattern Play with Jane Sassaman, and Art Quilt - Line Dancing with Jeanette De Nicolis Meyer. My requirements lists aren't long and I'm hiring a machine so I'm hoping to be well below my luggage limit - so I can bring some yummies back with me of course! 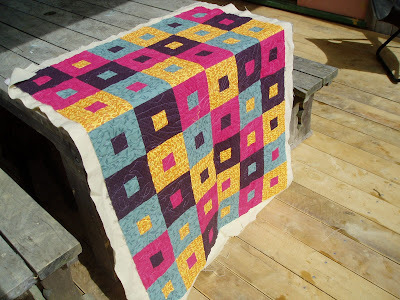 Beautiful quilt and your quilting is awesome! Oh lucky you to go to symposium.Have fun and bring home lots of yummy goodies. Very nice. I remember you doing the quilting at the all day madness last year. Obviously the madness didn't last one you got home! Now for your super quick binding and another one on the finished pile. Well done! It's gorgeous. i love your quilts, there's something very special about them. Ms Lottie, I love the flower!!! How do you make the flower? 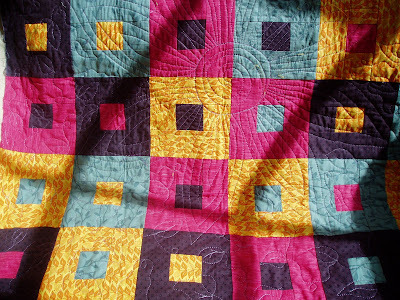 Beautiful - love the colours, and the quilting too! I love the flower you quilted in the center. I agree with the others, that stitched flower in the middle is the real icing on the cake, so to speak.